1955 (I'm told) CJ-5 - Can't find the Serial Number Anywhere! 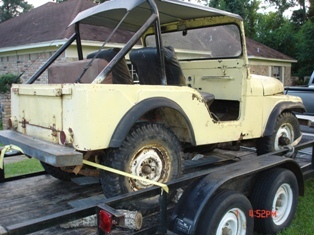 I just acquired a CJ5 and can't get the thing licensed. Jeep was in my son-in-laws family for past 25 years and never licensed. And said this jeep was put together with a couple (at least) of 1955 CJ5s. State police here in LA say they need to locate a number on the Jeep. I've searched for tags and numbers all over the cab & frame. This thing has been welded on all over the frame. So I just may not find a number. I may give up on this one! Larry's Comment: Might not help much Danny, but according to sources the serial number (assuming it still exists on your Jeep) should be located on a plate riveted to the firewall on the driver's side in the engine compartment...while a paint and trim option plate is located on the passenger side. The engine number (assuming the original motor) should be located on a pad behind the water pump on 134-ci fours and on a pad on the block deck visible between the first two exhaust manifold runners on the passenger side. Does LA have tags for custom vehicles? Just a thought. Good luck. Comments for 1955 (I'm told) CJ-5 - Can't find the Serial Number Anywhere! Hi, hope I can help. I am restoring a '46 Willys, and found myself in a very similar situation. I found my serial no. on the tailgate. It is stamped on the side under all the paint. So you will have to sand it down to bare metal to find it. I live in South Africa, and parts are very hard to find. I hope to get it finished soon. Happy Jeeping and good luck. Try the Driver's side firewall. It may be painted over. Or, by the steering box by the tub brace. My Jeep is identical to yours and ours was on the firewall. But if you would like I can do more research for you. I have a 1952 I think m38a1...all data tags are missing...I did find the engine number above the water pump...R4J 09108...but I can't find anywhere on line telling me what year it is...can anyone help me please? I'd be more then willing to take it off of your hands. Mine has the mentioned metal tags on the firewall. Odd thing is I can't find my serial # listed. The first 5#'s are 57548 which are used on many years starting in the 50's and go to about 61. Accordingly, it is a Universal/CJ/1324cu.in. F-Head/all wheel drive. Mine is a 1963, according to title and my Dad bought it brand new, but the charts only list to 1961?